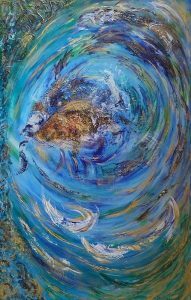 We are delighted to be exhibiting the stunning artwork of artist Furrah Syed at 15 Sackville Street, Mayfair, London. Furrah is a London based artist who paints heavily textured canvasses. Furrah studied Fine Art and Textile Design along with Art History in London before embarking on a corporate career in Finance and Marketing. It wasn’t until Furrah and a career break where she reignited her passion for art. Since childhood. Art- has always been a part of me in many forms whether it was in a creation or appreciation capacity. I have been a full-time artist for the last fifteen years. There is a huge list of names that come to mind, but the most prominent are Kandinsky and Hieronymus Bosch. Kandinksy because he is one of the founding fathers of true abstract art. His approach to colours and shapes was on a spiritual level and he broke the pre-existing ‘rules of art’ left right and centre. I love a rebel! Bosch because of the sheer bravery of his images which depicted the most disturbing and beautiful images, jaw dropping stuff when you consider it was created in the 16thCentury. I would have loved to have seen and heard the reactions of his audience! Art speaks to us in many forms these two amazing artists move me deeply. I strive to express my love for colour, energy, movement, interactions with light and the sensory delight of feeling the surfaces of the canvas. There are as many interpretations as one wishes, there is no right or wrong. I am very passionate about sharing my art with all, there are no boundaries, only pleasure and emotion. I am not able to separate the two. My works begin with a colour combination which is as close to the subject as you can get in my works as they are abstract. The execution has to be free flowing without me planning it. I literally see where the palette knives take me. Before I start a piece I will connect with the blank canvas and just feel the surface. Move my hands over the fabric in waves of movement so I can get some sense of the dominant spaces, perhaps which areas will hold the most texture. I really do not limit any creative flow, it’s the only way I can work. I am grateful to find it hard to answer this question as I have completed a number of projects over the years. For painting, perhaps the piece I created for The Tottenham Hotspur Foundation and Barnet and Southgate College for the opening of their new Learning Centre. It was a huge piece that is in their main reception. I had a very limited time in which to complete it, but thankfully made it thanks to a lot of late nights. Students there still tell me how much they love the piece. For the education side of my practice it is my Art Appreciation Workshops for the Blind and Partially Sighted. Having conducted my workshop globally it has been an honor to have met so many wonderful people. Each country proving that art transcends all boundaries including; gender, age, culture, religion, language and disability. I have had a number of people become very emotional when they stand in front of some of my works. 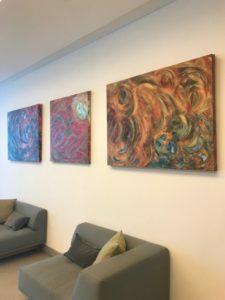 It is a deep connection that is made and somehow the colours, textures and flows of movement on the canvas really evoke a very personal response. This happened very early on in my art career and it is one of the things that hugely encouraged me to continue to create and share my abstracts. I have continued exhibiting my works with Espacio Gallery and working with the Artist Pool. I have been regularly commissioned by clients both private and corporate which is always a fulfilling experience. Two and a half years ago, I moved my practice to Thames-Side Studios in The Royal Borough of Greenwich. It is the most creative site with over 500 practicing artists in a seven acre space. It is a riverside location so that is always a wonderful place to be, the views are stunning! I have really enjoyed taking part in the Open Studios that we have once a year. It is a wonderful experience to showcase work in a place where there is a busy footfall. Different to exhibiting in a gallery as that is usually for a shorter time and the audience are those that seek out an art experience. 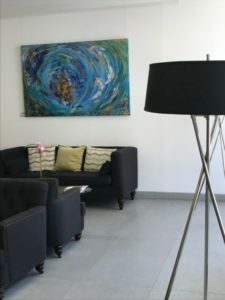 Having my works in a corporate setting means they get to be seen by a larger number of people. Art can be a welcome distraction sometimes. 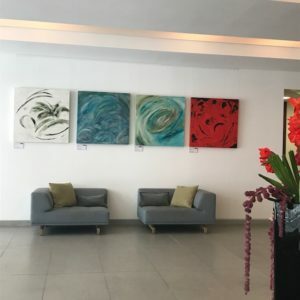 It makes me happy to think someone passing by might enjoy seeing my vibrant and energizing abstracts and feel a connection before they get on with their usual business of the day. The exhibition will run from until mid January 2019 at 15 Sackville St, Mayfair, London, W1S, 3DJ. All work on show is available to purchase. For further information or to arrange an appointment to view contact info@artful.org.uk or call 0208 702 8030.